Today we’re setting up some ARGB fans with a motherboard that doesn’t have any RGB or ARGB headers to see what’s involved. 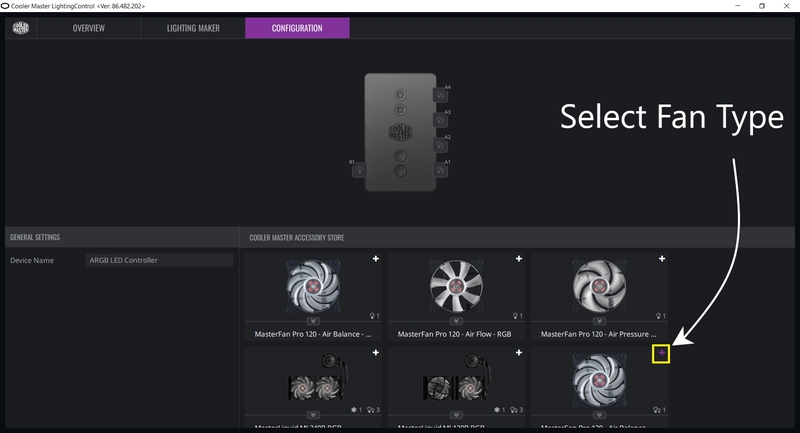 We’ll also be controlling these via software, so we can enjoy all the customisation options that come with the latest addressable RGB kits! 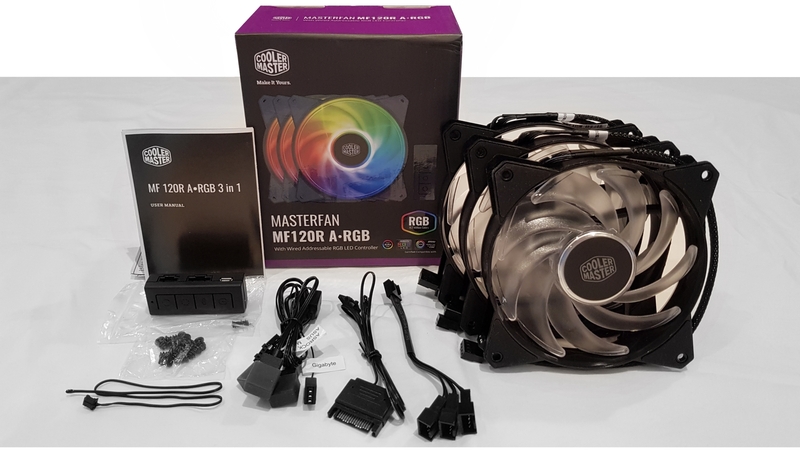 For this we’re going to be using our favourite Cooler Master ARGB 3x Fan Kit as it has a fan controller included, before we get stuck into the install we’ll just take a quick look at what comes inside the box. First, we connected the ARGB Cable (it’s got 3 pins, shown below) and the Fan Power Cable Splitter (ignoring the Asus and Gigabyte connectors) to the appropriate connectors on the fan cables. The ARGB and Fan Power connector types are clearly marked on the cables with white tags. The green arrows below show the little triangles that match up. We then connected the ARGB Cable 5 pin connector and the SATA & Thermal Detection Cable 4 pin connector to the controller. Finally, we connected the SATA & Thermal Detection Cable into the Thermal Detector and SATA power connector from the PSU. 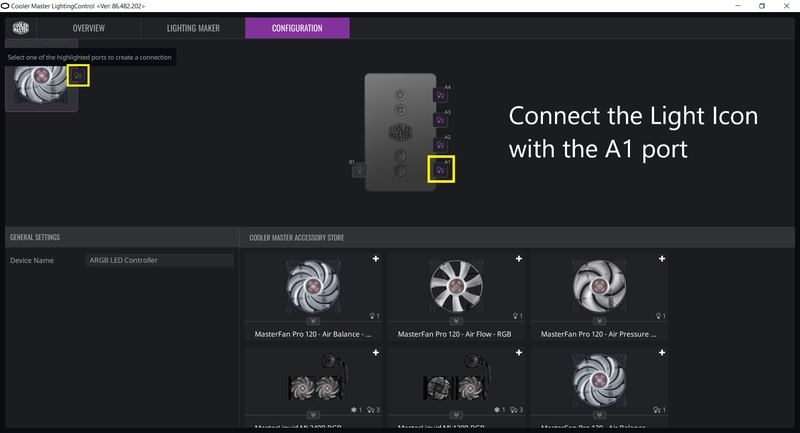 When turning on the PC we had success, the fans were running fine and the LEDs lit up – able to be controlled through the buttons on the ARGB controller. With everything running as it should, we then started fitting these new components within the gaming PC. For maximum visibility, we’ve replaced both fans on our CPU cooler and installed the third fan onto the rear of the case. 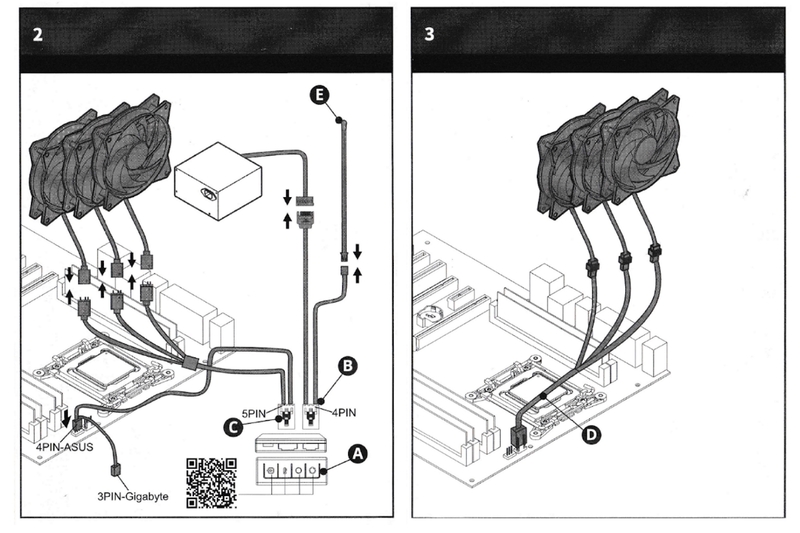 Given this setup involves the CPU cooler, the splitter cable was removed and the power cables for the fans were instead connected directly to the motherboard. The ARGB controller is easy to mount into the case as it is magnetic, and with you’ll have a few static colours, cooler effects and the beautiful ARGB rainbow mode – but we want software controls for more customisation options! After searching the MasterLiquid ARGB pages we found that they had the following downloads though, so we continued on! Here we opened up the detected controller and then navigated to the configuration page. 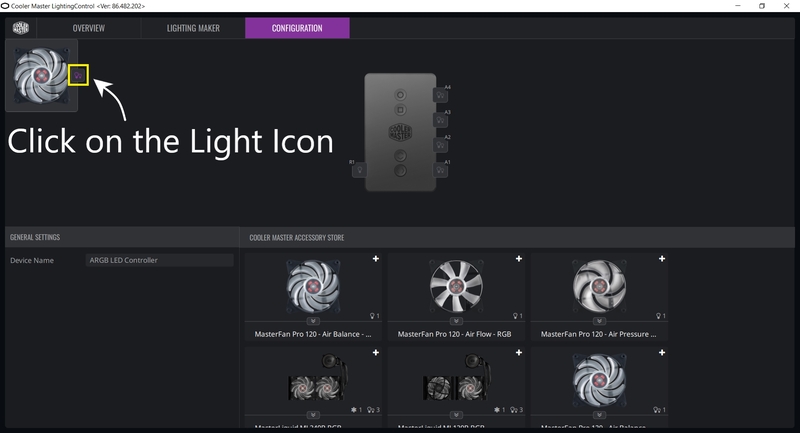 This will add the fan into the top left-hand corner, next, we click on the light bulb icon of the added fan. 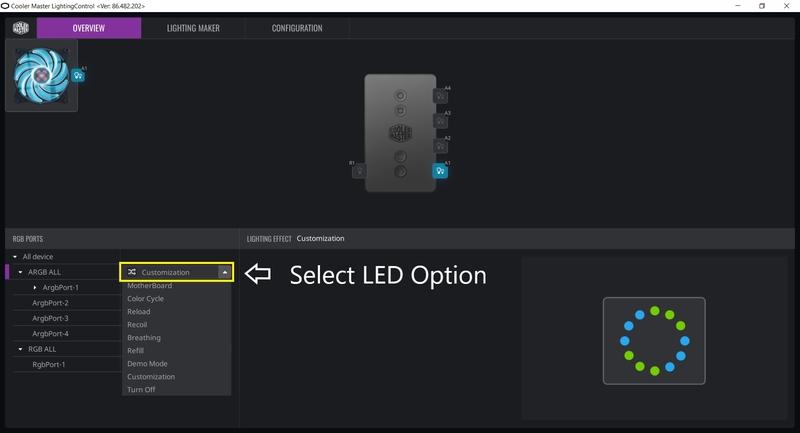 Then connect that to the first controller port by clicking on the light bulb icon with the A1 next to it. OK, now that tricky bit is done, we can begin changing the LED modes and individual LED colours! 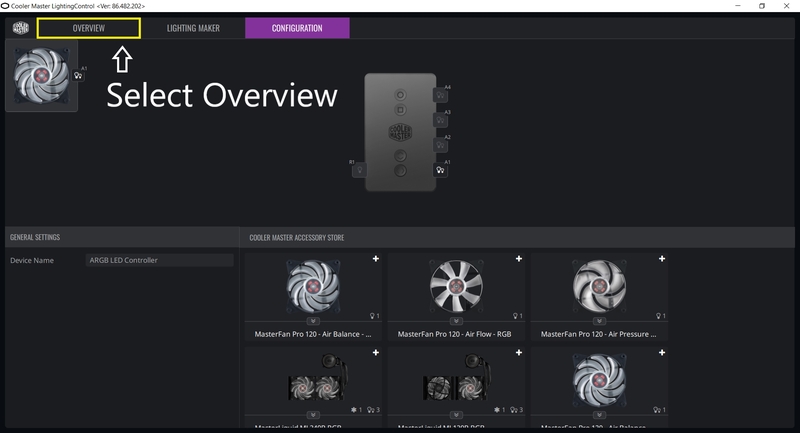 As we have our fans connected to the first port on our controller we can configure and customize through the overview tab. 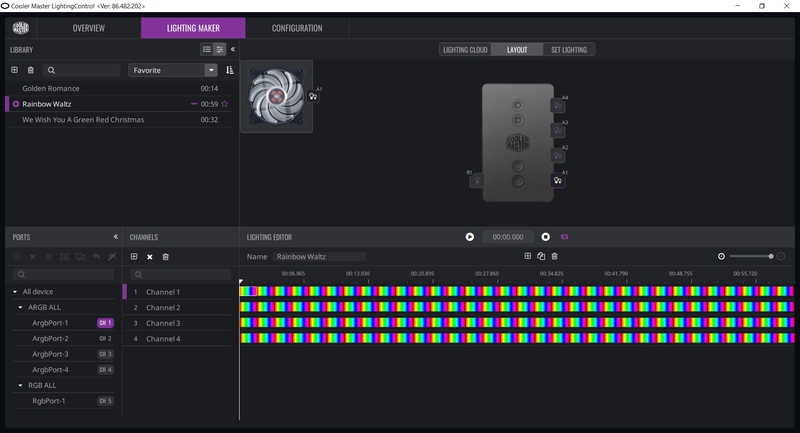 From the overview tab, you can select the different patterns for the LEDs. PLEASE NOTE: Due to changing the firmware the button on the controller that cycles the modes is changed to match this order. 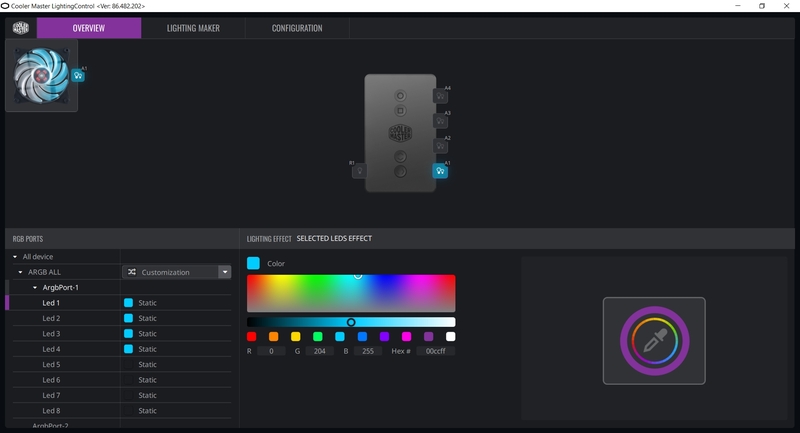 If you select the Customization option you can select the colour for each individual LED!